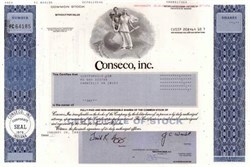 Home > Banks and Insurance > Insurance Companies > Conseco, Inc. Beautifully engraved certificate from the Conseco, Inc. This historic document was printed by the American Banknote Company and has an ornate border around it with a vignette of an allegorical man and woman leaning on a globe. This item has the printed signatures of the Company’s Chairman and Secretary. Headquartered in suburban Indianapolis, Indiana, Conseco, Inc., is one of middle America's leading sources for insurance, investment and lending products. Through its subsidiaries and a nationwide network of distributors, Conseco helps 13 million customers step up to a better, more secure future. Indianapolis, Ind. 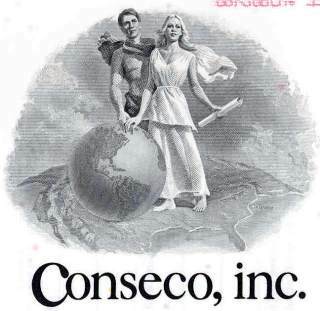 : Jan. 31, 2003 – Conseco, Inc. (OTCBB:CNCEQ) announced that it filed its Joint Plan of Reorganization and Disclosure Statement with the Bankruptcy Court today, representing a key step toward its successful emergence from Chapter 11. The hearing on the adequacy of the Company’s Disclosure Statement has been set for March 5, 2003. Conseco, Inc. President and Chief Executive Officer William J. Shea said that following approval of the Disclosure Statement by the Court, Conseco will commence the solicitation of votes of its creditors for the approval of its Plan of Reorganization. “We have worked very hard with certain key creditor constituencies to develop a Plan that will provide the reorganized Conseco with a capital structure that can be supported by cash flows from ongoing operations,” said Mr. Shea. Under the terms of the proposed Plan, which are consistent with the agreement in principle announced on December 18, 2002, CNC will substantially reduce its debt and future annual interest expense. Upon emergence from Chapter 11, Conseco, Inc. will be engaged exclusively in the insurance business. The Company’s finance subsidiary, Conseco Finance Corp. (CFC), continues to pursue the sale of its assets through the Chapter 11 process. The proceeds from this sale are expected to be used to satisfy the creditors of CFC. The final sale hearing is currently scheduled for March 5, 2003.